Dear reader: If the politics behind Salmonfest don’t interest you, feel free to skip to the next bolded subhead, “Enter the Music,” for reporting on bands and headliners already signed for the August 2018 event. Otherwise, start with the next paragraph for some behind-the-musical scenes insight regarding this August festival in Ninilchik celebrating all things salmon. Salmonfest 2018 organizers are cautiously celebrating the arrival of a bit of help in the fight against the proposed Pebble Mine from an unexpected source just as headliners for the August festival held in Ninilchik were announced earlier this week. Stearns – a long-time activist for the protection of salmon streams – said Friday’s move by Scott Pruitt, EPA administrator under the Trump administration, seemed a bit out of past character for Pruitt, the former Oklahoma attorney general who strongly fought EPA activity in that state well known for its oil and other natural resources. Coffee shop talk is that Pruitt had a holiday dinner with Bob Gilliam, Alaska’s wealthiest businessman valued by Forbes in 2015 at $320 million as the founder of McKinley Capital Management. Talk is that Gilliam is believed to have bent the government man’s ear a bit about how 65 percent of Alaskans statewide oppose the proposed mine that biologists indicate would – not could – endanger the 56 million salmon estimated in that fishery that produces anywhere from $250 million to $480 million per year in economic activity just in Alaska with an approximate $1.5 billion multiplier impact nationwide. It equals one-sixth of the nation’s total yearly fishery. Gilliam has a large spread near Lake Clark National Park and Preserve and is well-known for his protectionist stance regarding the state’s salmon resource. The Pebble Mine – a project thought dead in early 2017 – resurfaced as a possibility in the summer and fall as the Canadian-owned company threw its hat in the ring of potential producers after three of the world’s largest mining companies – Anglo American, Mitsubishi and Rio Tinto – walked away from the project frustrated by Obama-era restrictions. This left Northern Dynasty – the remaining potential developer that has been working the Pebble Mine project for 15-plus years – looking for support. According to reports by the Associated Press, Pruitt told EPA staffers in May 2017 to reverse the agency’s Obama-era stance that utilized a rarely activated provision in the federal Clean Water Act to employ a much more stringent permitting process for Bristol Bay for ecological reasons. Pruitt is reported to have told agency workers to allow the permitting process to go forward with eased restriction for newly-interested resource developers. In fall 2017, Tom Collier, Pebble CEO, said the company would apply for permits in Dec. 2017, to build a smaller mine than previously proposed. This mine would be 5.4 square miles with a total mine site of 12.7 square miles. But as of last week, the EPA raised the bar for the permitting process as it pertains to Bristol Bay and the Pebble Mine Project. Reportedly, Pruitt did a review of the public comments received by EPA in 2014 regarding proposed Bristol Bay and Pebble development and did an environmental about-face on his May 2017 more relaxed approach to permitting for the proposed mine. Rock on, said Stearns, who said he and other pro-salmon supporters are “happy” regarding Pruitt’s announcement last week but remain wary and intend to go forward with a variety of salmon protection initiatives and projects in Alaska. That includes lining up musicians for the Aug. 2018 Salmonfest that share his environmental concerns. Headlining Saturday night at Salmonfest this year is a performer Stearns said is perfect for an election year and to energize a fight for the environment and salmon. Michael Franti & Spearhead – a Boulder, Colorado, band blending hip hop with funk, reggae, jazz, folk and rock – has created what is known as the Global SoulRocker Community and Family based on humanitarian work and promotion of recycling. 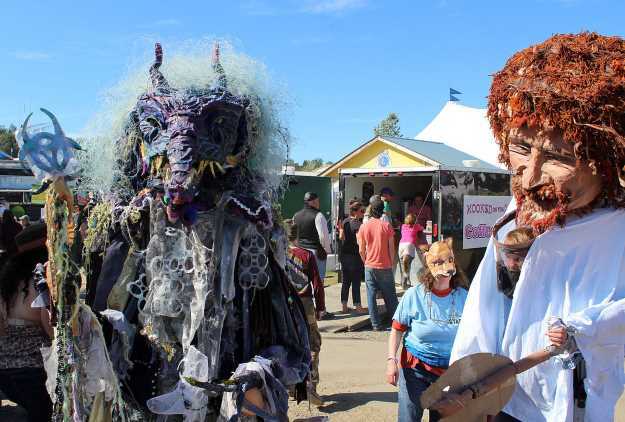 That second element – recycling – is a key one for Salmonfest as last year marked the first go at a zero waste operation. Stearns said the effort in 2017 went well and the festival for 2018 will build on that again in an effort to leave no trace. Franti & Spearhead have played Alaska numerous times and have a loyal following, Stearns said, adding that the Ninilchik fairgrounds where Salmonfest is held most likely will be packed for the Saturday night appearance. Other acts confirmed for the 2018 Salmonfest include: Achilles Wheel, Cherry Poppin Daddies, Front Country, Fruition, Gasoline Lollipops, Intuitive Compass and Lowdown Brass Band. Find them online at www.achilleswheel.com. Find them online at www.daddies.com. Front Country is a progressive RootsPop band from San Francisco. The five-member band played monthly gigs until the end of 2012 and start of 2013 when they won both the RockyGrass and Telluride music festivals launching their career in the same manner as was done for the Dixie Chicks and Steep Canyon Rangers. Their first album, “Sake of the Sound,” was released in 2014. Their second album, “Other Love Songs,” features tunes that inspire listeners to mature emotionally and deal with the vulnerability of believing in and needing to break down toxic romantic fairy tales. Find them online at www.frontcountryband.com. The band’s lead singer, Kellen Asebroek said via the band’s website that the album contains songs that are mostly about romantic breakups. “There was love and now it’s gone—we fucked it up, or some outside circumstance brought it to an end. It’s about dealing with all that but still having hope in your heart, even if you’re feeling a little lost and jaded,” he said. Find Fruition online at www.fruitionband.com. The Gasoline Lollipops – also from Colorado – brand their sound as “alt-country that combines the sincerity of dirt-floor folk with the rebelliousness of punk.” Readers of The Colorado Daily newspaper voted them the “Best Local Musician/Group” in 2017. The Denver Post labelled the group as, “uncompromised, vicious and authentic.” The band’s song, “Hard Times,” is said to resemble the baritone twang of early Johnny Cash and another song, “Vanilla Baby,” contains sounds similar to Bruce Springsteen and Buddy Holly. The band’s leader singer, Clay Rose, is the son of Donna Farrar, who co-wrote the 1982 Willie Nelson hit, “Last Thing I Needed First Thing This Morning,” from the “Always On My Mind” album. Stearns is particulary stoked about landing the Gasoline Lollipops. Find them online at www.gasolinelollipops.com where the band also offers their albums for sale in vinyl. Find them online at www.intuitive-compass.com. The Lowdown Brass Band hails from Chicago and its website indicates the band’s “dynamic vocalists, hip-hop MCs, and body movement gets any wallflower up and on their feet.” The band began 15 years ago as a New Orleans cover band but has evolved in to its own sound with a fusion of funk, soul, reggae and hip-hop influences still giving nod to the funky sound of a Mardi Gras parade while putting their unique spin on old favorites. Find them online at www.lowdownbrassband.com. Salmonfest organizers offer reduced ticket pricing until Feb. 10 at the festival’s online site: www.salmonfestalaska.org. Salmonfest, which features bands from across the country as well as a variety of salmon education displays, is scheduled for Aug. 3-5, 2018. Reach Amy Armstrong via email at: asocialbutterfly@gci.net.